In the previous post I mentioned the photograph that crushed any lingering ‘Downton’ delusions of grandeur I might have harboured about my family. Well, here it is! Both of my great-grandmothers are here – one seated at the front (the upright woman in black dress) and the other is the tiny, slightly haunted, woman with a large hat (three in from the left). 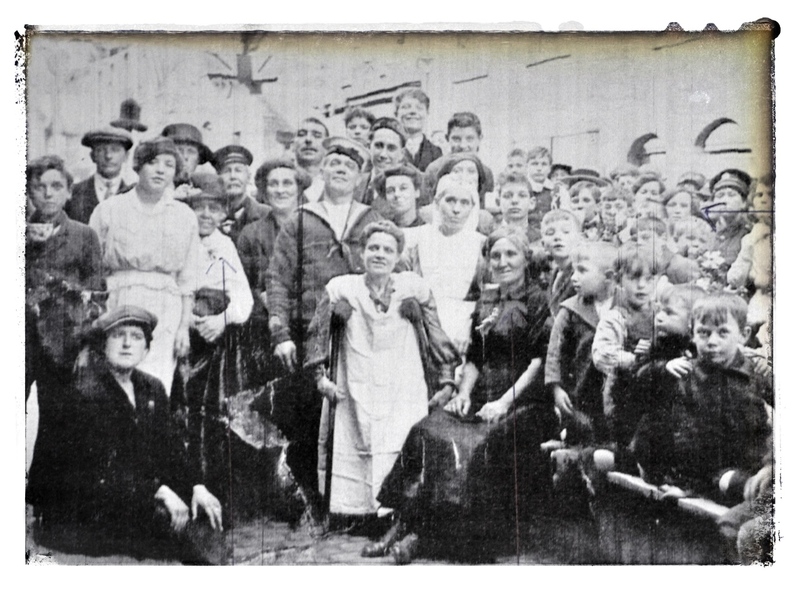 The photograph shows the residents of St Ann’s Street, Limehouse where the Kellys and the Becks (both sides of my maternal family), lived in the last half of the 19th century and into the first decades of the 20th. As you can see, St Ann’s Street was not prosperous. Most of the people who lived there worked ‘on the docks’ – and that’s if they were lucky enough to pick up a job. I’m not sure of the reason for this gathering of the clans, but I do know that I like the look of my grandfather, Michael Kelly, (always known to his children and grand-children as ‘Timo’). He’s the bold boy with the teacup on the far left of the photograph – and I rather think he resembles Terence Stamp.